Photos courtesy of Furry Kids Refuge. Bob’s a big, beautiful ginger boy who’s friendly to all the earth’s creatures. (The Doctor would approve!) At just two and a half years old, Bob’s still a young guy with plenty of love and life ahead of him. Whether you’re looking to adopt your very first four-legged friend, or add another furry critter to your pack, Bob’s the guy for you. He’s currently staying with Furry Kids Refuge, a no-kill shelter in Kansas City, MO which is desperately in need of foster homes and dry food. Keep reading for details! Approx. Weight : 15 pds. Bob is a beautiful, BIG, orange short hair cat. This kitty is a absolute perfect boy……he loves other cats, loves dogs, loves people ! Sometimes we worry about his safety because he is not scared of any other animal and thinks they all love him as he loves them . He will go up to all dogs and wrap himself around their legs and purr the whole time. Bob is such a special kitty. Bob was originally named ‘Bob The Barn Cat’ because someone had dumped him in the country and he made his way to one of our members barn. Everyday he would talk to them as they came out to the barn and would follow them along the road back to their door ….but never got close enough for them to touch. Finally, after a couple of months of the husband feeding him can food and talking to him nightly, Bob came inside the house. He never left after that and settled in like he had always been a inside kitty. So now he is just ‘BOB’. Bob is litter box trained, he has been FIV/Feline Leukemia tested negative, vaccinated, micro chipped and you can fill out a application for Bob at www.furrykidsrefuge.org, click on ‘Adopt A Cat’. A dedicated volunteer will be in touch. Thank you for your interest in Bob. Would you like to foster a Furry Kid? Furry Kids’ Refuge will supply the food & vet care while you supply the basic house rules & love…….win-win for all!! Just visit www.furrykidsrefuge.org and click on the ‘Foster a Furry Kid’ link. Thanks for your support! We are in desperate need of Dry Cat food! If you can help, items can be dropped off at our weekly adoption event at the Lee’s Summit Petco every Saturday from Noon-4pm. Or call 816-277-8284 to arrange for pick-up of large donations. THANK YOU! Posted: 11/30/12 at 11:28 am. Filed under: Find-a-Friend Friday. 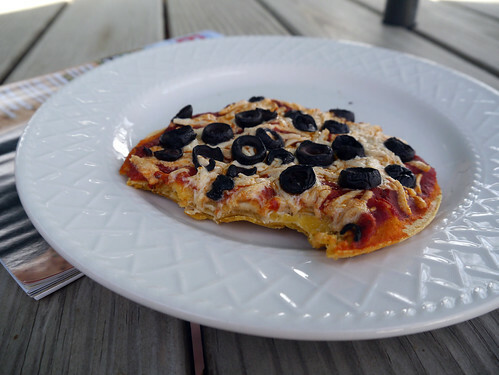 This one’s for the Daiya cheese lovers in the house: a multilayered tortilla cheese pizza in which each tortilla is “glued” to one above and below it with a healthy (or not!) dollop of melty, oozy, gooey Daiya cheese. Is your stomach rumbling cries of assent yet? The idea came to me while I was doing yoga – make of this what you will! I kept the pilot pizza simple, since I wasn’t sure how well it’d turn out. (As it just so happens? AMAZING!) Topped with red sauce, more mozzarella Daiya, and a generous serving of black olives because YUM. (Olive haters, take it outside!) The tortillas are corn – though in all honesty I prefer flour – since that’s what we had on hand. (Leftovers from the South-of-the-Border Potato Tacos I made for Vegan MoFo. FRIED. Yeah, you heard me right!) I only used three tortillas, but you can stack ’em as high as you think your mouth can stretch. 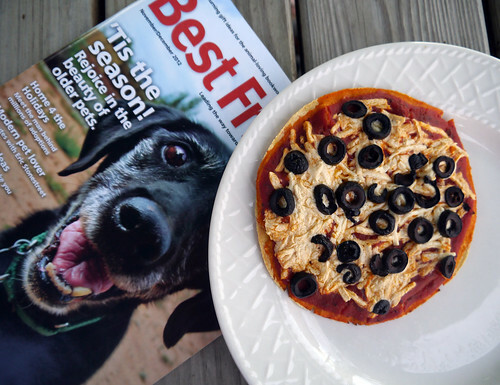 I photographed my pizza next to the latest edition of Best Friends magazine, to provide some scale, and also because this month’s cover dog is too adorable for words. (The winter issue is dedicated to senior dogs, yay!) 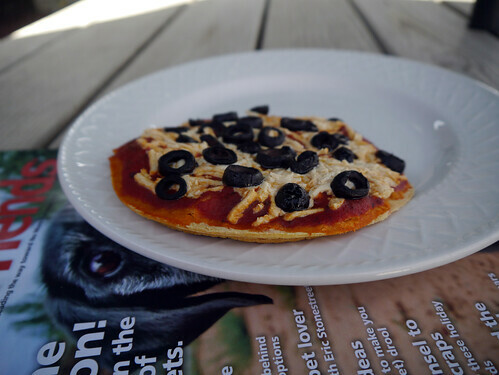 The tortillas are on the small size – smaller even than the pita bread I normally use for pizzas on the go – which makes for a nice lunchtime personal pizza. You can use any size/flavor tortilla your heart desires – the principle remains the same! 1. Preheat the oven to 425F. Cover a cookie sheet with parchment paper. 2. When the oven’s almost done heating up, assemble your pizza. Spray the bottom of one tortilla with cooking spray and lay it (wet side down) on the parchment paper. Sprinkle a moderate amount of cheese on top and add the next tortilla. (Don’t coat anything but the very bottom of the pizza with spray.) Repeat these steps until you reach your final layer. Top with a good amount of red sauce (relative to the height of your pizza, that is! 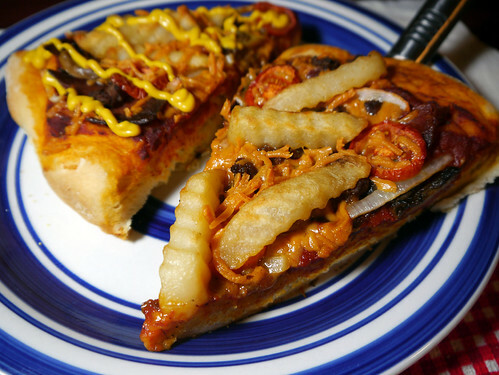 ), more cheese (if desired), and your favorite vegan toppings. 3. Bake at 425F for 10 to 20 minutes, or until the cheese is melted to your liking. The pizza will flatten out a bit as the layers of cheese liquefy. Posted: 11/27/12 at 12:33 pm. Filed under: Food & Recipes. 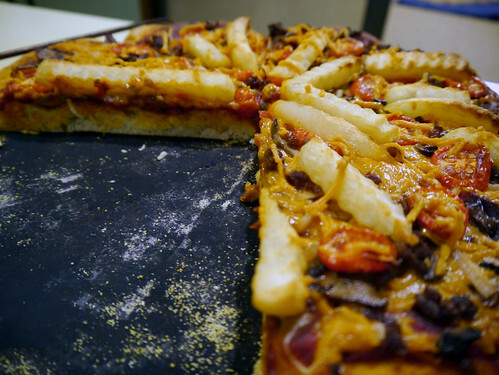 This vegan pizza is so fierce it sparkles! With BBQ soy curls, red onions, jalapenos, and mozzarella Daiya. CC image via flickr user hoveringdog. vegankatie: What’s that? Vegan pancakes, with vegan ice cream and maple syrup? Posted: 11/24/12 at 1:08 pm. Filed under: Saturday Garbage Plate. Photos courtesy of Pasado’s Safe Haven. I know that Tofurky Day has come and gone, but in honor of the holiday, today’s adoptable animal is (drumroll please) a turkey! Depending on where you live, adoptable farmed animals aren’t always easy to find locally; birds who are exploited for their meat, like chickens and turkeys, are even rarer at shelters and humane societies. So today, let’s take a trip to Sultan, Washington, where Pasado’s Safe Haven cares for a variety of companion and farmed animals – turkeys included. Along with Newbie and Eagle, George the turkey is one of a few lucky birds who have found refuge at Pasado’s. George is a 3 year old, male, Bronze Turkey. The Bronze turkey has very big, patterned and colored, fanning plumage to show off and this big beautiful guy is a typical older male turkey. He is very confident, and gets along well with everyone, assuming they give him room to strut and spread out those gorgeous feathers that make the turkey ladies swoon! George is able to fly, and can go over the 4 foot fence with ease, so any family that takes George in, should be aware that he needs an extra high enclosure to keep him safe from predators. George gets along well with chickens, roosters, and other turkeys, but should be monitored when he is with other male turkeys to ensure that no rivalries are started. George loves to roost, and it is not uncommon to find him perched somewhere high, resting and watching the flock. If you’re not set up to care for farmed animals – and, let’s face it, most of us aren’t – please consider a donation to help fund Pasado’s kind and compassionate work. Like many rescue groups, they also need volunteers, foster homes, and even an intern. Please spread the word (and spare the turkeys)! Posted: 11/23/12 at 1:02 pm. Filed under: Find-a-Friend Friday. 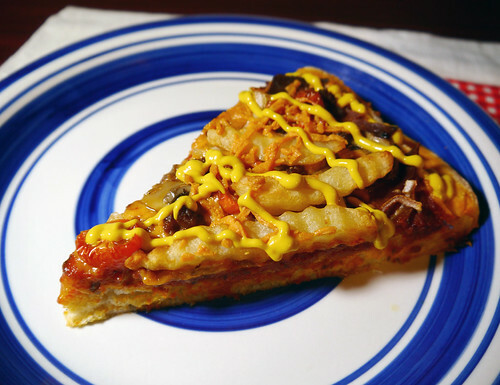 When I first hatched the idea for this pizza, I thought about making it for Thanksgiving. I mean, what’s more American than bacon cheddar cheeseburgers and pizzas, right? Alas, it proved a tough sell to Shane, who hearts his seasonal holiday foods. Instead we compromised on these epic looking Thanksgiving Burgers, and made the pizza on Saturday night (aka pizza night). Hey, works for me! I know I say this about all the pizzas, but omg you guys this is AMAZING! 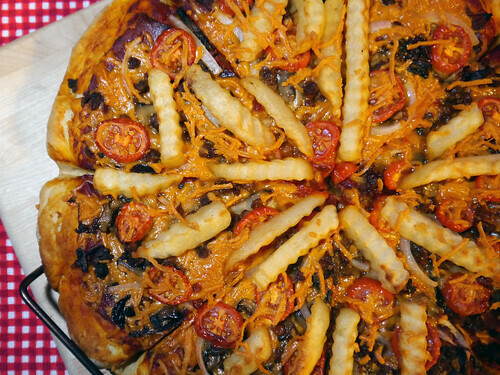 Fried soy bacon, savory vegan ground round, crispy crinkle fries, mounds o’ melty Daiya cheese – not to mention onions, tomatoes, and mushrooms – this pizza has got it going on! Like a bacon cheddar cheeseburger with a side of fries, but more better. Serve with a pickle on the side and a chocolate milkshake to wash it all down! 1. Several hours prior to making the pizza, prepare the dough. In a large bowl, combine the sugar, yeast, and water; mix until completely blended. Add the salt and olive oil and mix well. Add the flour in stages (about 1/2 cup at a time) and mix until the flour forms into dough. On a lightly floured surface, knead the dough by hand and shape into a ball. Cover loosely with a towel and leave the dough to rise, anywhere from 30 minutes to two hours. 2. When you’re ready to assemble and bake your pizza, preheat the oven to 425 degrees F.
3. In a large frying pan, heat the olive oil on medium. Add the Smart Bacon and fry on both sides until crispy. Set aside. 4. In the same frying pan, cook the mushrooms until brown. (Optional; I prefer to fry canned mushrooms, but not fresh ones. I’m weird that way!) Set aside. 6. Next, add your toppings. Start with the red sauce, followed by the greens, bacon, cheese, ground round, onion, mushrooms, and tomatoes. (The amounts listed above are just a guideline; use as much or as little of each as you like.) Finish off with a little more cheese to bind everything together. Optional: if you’d rather bake the condiments right into the pizza, mix the mayo, ketchup, and/or mustard in with the red sauce before spreading it on the pizza. Or eliminate the red sauce altogether and use ketchup instead! 7. Bake at 425 degrees, for between 15 and 20 minutes for a single pizza, or 30 minutes for two pizzas. Serve with a dill pickle on the side. Die happy. Posted: 11/21/12 at 12:05 pm. Filed under: Food & Recipes.